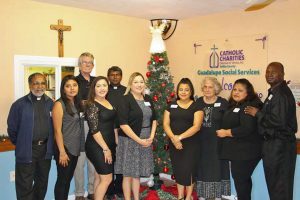 As part of the year-long celebration of Catholic Charities Diocese of Venice Inc. providing services in Collier County for 50 years, Guadalupe Social Services of Catholic Charities in Immokalee held a Dec. 8 open house for supporters of the program. Attendees enjoyed food, drink and fellowship along with a video presentation and informative tours of the services available at Guadalupe Social Services, which has been in operation for 38 years. 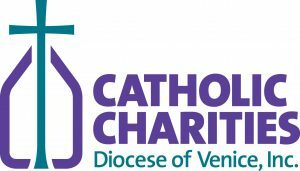 During 2018, Catholic Charities has been proud to mark 50 years of changing lives in Collier County. Hospitality for the open house was graciously provided by The Warehouse and the Seminole Hotel Casino Immokalee. With the aid of many supporters offering time, talent and treasure, Guadalupe Social Services is able to provide assistance to people in need in Immokalee. 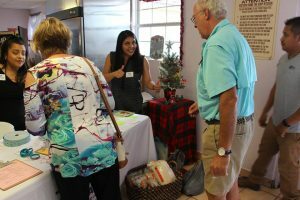 Visitors are greeted Dec. 8 to the Guadalupe Social Services of Catholic Charities Open House in Immokalee. Immokalee has long been a region of poor migrant workers. Half of the population lives at or below the poverty level. Over the years, more families have chosen to make Immokalee their permanent home and work in low-income jobs including: landscaping; hospitality; restaurants; farms; and packing houses. There is an extreme culture of poverty that exists in the town of Immokalee as 44.8 percent of the population lives below the poverty line. Guadalupe Social Services aims to alleviate the suffering in Immokalee with compassion, integrity, and empathy. By empowering the people through assistance provided to them, the main goals are to ensure human dignity and enhance the quality of life for all individuals served. Guadalupe Social Services focuses on offering the basic needs of food, shelter, clothing and household items, in addition to stability and education. The staff of Guadalupe Social Services of Catholic Charities during a Dec. 8 Open House in Immokalee. The program offers a number of vital services including: free hot lunches five days a week at the Casa Maria Soup Kitchen; a clothing room and showers; a food pantry; direct assistance with rent and utilities; immigration services; English as a second language classes; and a crib and stroller program. Volunteers are the backbone of Guadalupe Social Services and allow the program the ability to provide these vital services to the needy in the community. Additional volunteers are needed for the food pantry, soup kitchen, and help in the office. If you would like to directly support the program nonperishable food, clothing and household goods are always needed at Guadalupe Social Services. Seasonal donations are necessary for back-to-school items, and Thanksgiving and Christmas food distributions. For more information about volunteer opportunities and donations, please call 239-657-6242, visit www.catholiccharitiesdov.org or send donations to Guadalupe Social Services of Catholic Charities, 211 S. 9th St., Immokalee, FL 34142.